When it comes to eating healthy, I often hear people say that meat was the first thing they cut out of their diet. With Beyonce and Jay-Z taking on the part-time vegan diet (eating no animal products for one month), I’ve noticed that cutting out meat is quickly becoming a diet trend. But I always remind those who’ve cut out meat with the goal of losing weight that they may drop some pounds, but they’re also losing some of the health benefits meat has to offer. And a new study I came across recently helps prove my point, suggesting that protein from lean meats, such as fish, can actually reduce your risk of stroke. The study I read from Nanjing University School of Medicine in Nanjing, China found that people with a high percentage of lean animal fats in their diet were 20% less likely to suffer a stroke than individuals who eat little or no protein. A significant difference, I’d say! I also read that the researchers found that for every 20 grams of lean animal fat an individual consumed per day, their risk of stroke dropped by 26%! They also speculate that if everyone increased their protein intake from lean meats, then there would be a decrease in the number of disabilities from stroke and 1.4 million fewer deaths! Finally, in the study’s conclusion, I read that animal protein offers far better protection against stroke than protein from vegetables. But that doesn’t mean you should start to overeat meat, as many sources of animal protein also contain saturated fats, which can lead to stroke. So it’s about making smart choices. This doesn’t mean that you should run out and start eating hamburgers and steaks; stick to healthy sources of animal protein instead, such as fish or chicken, and bump up your protein intake with healthy vegetables. Fish has traditionally been linked to a healthy diet, while consuming large amounts of red meat has been shown to increase the risk of stroke. It has been suggested that the nutrients found in lean animal proteins protects against the hardening of the arteries, high blood pressure, and diabetes. So it makes sense that these sources of protein would help reduce your risk of stroke as well, especially if you have high blood pressure. So to lower your risk of stroke, start by introducing lean animal protein in your diet, along with vegetable proteins. Vegetable proteins, while lower in their ability to reduce your risk of stroke (12%), will help you limit your intake of saturated fats, while the animal proteins will boost your intake of essential amino acids. But you can’t just rely on diet alone to protect you from stroke. You need to create a healthy lifestyle, too, to see the full benefits. Two simple steps: 1) If you’re a smoker, quit; 2) Pump up your heart with low-impact cardiovascular workouts, like swimming or aquafit classes. When it comes to your health, the little steps help to lower your risk of disease and lead an all-around healthy lifestyle. 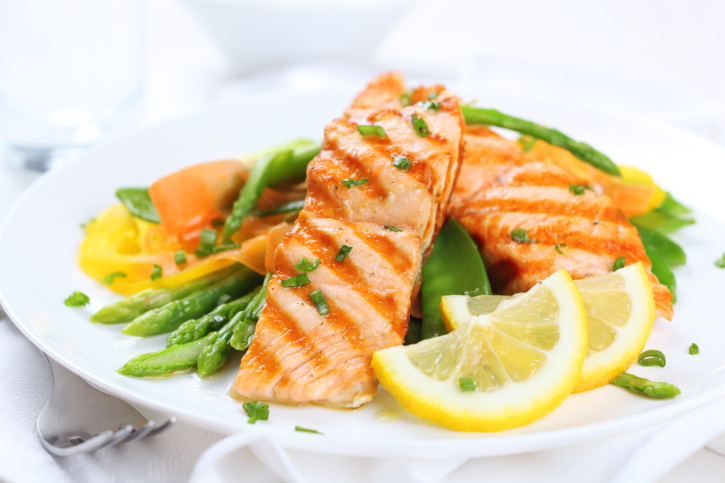 “Diets Rich in Protein May Help Protect Against Stroke,” MedlinePlus web site, June 11, 2014; http://www.nlm.nih.gov/medlineplus/news/fullstory_146757.html.